Origin and Habitat: Nwanedze River, 65 km east of Messina, Transvaal, Republic of South Africa. Description: x Staparesia meintjesii (formerly known as Tavaresia meintjesii) is an exceptional beautiful Stapeliad with very pretty markings on this flower, etched in maroon. 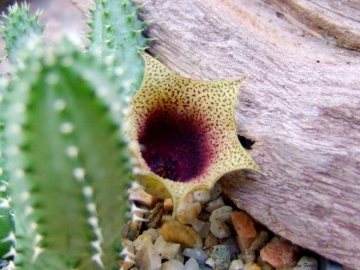 Leach suggests that it is possibly a natural hybrid between Stapelia gettliffei R. Pott (or Stapelia gigantea N.E.Br.) and Tavaresia barklyi (Dyer) N.E. Br. (syn. Tavaresia grandiflora). 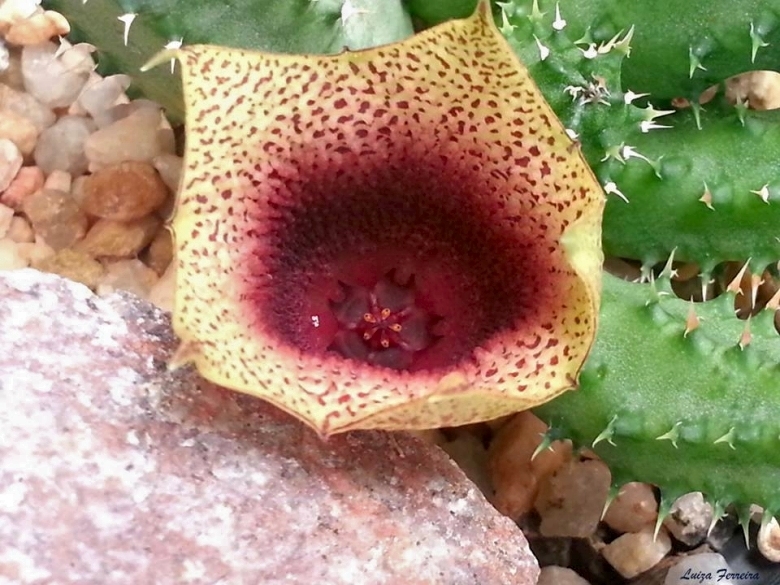 This cross has also been successfully repeated in cultivation either with Stapelia gettlifei and Stapelia gigantea. Leach says that there are 2 flower colours seen in such hybrids. One with a lighter colour (hybrid with Stapelia gigantea) and one with a darker colour (hybrid with Stapelia gettlifei). Both this hybrids should be named Staparesia meintjesii. 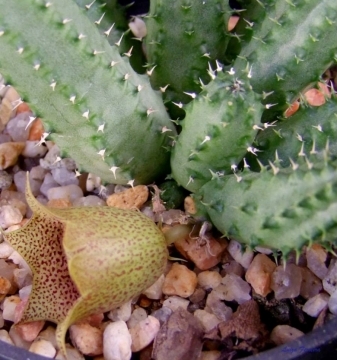 Cultivation and Propagation: x Staparesia meintjesii grows robustly and is far less temperamental than Stapelia is in cultivation, and hence is more akin to Stapelia gigantea, which is amongst the most resilient stapeliads in captivity. S. meintjesii is a worthy addition to cultivation and deserves to be widely grown and appreciated, since it makes an ideal hanging-pot plant, in which the flowers dangle over the pot edge. Soil: They grow well in light gritty soil with a very liberal drainage. Watering: They should at all times sparingly watered (best rain water with some occasional fertiliser), and in winter time they hardly require any. Temperature: They require outdoor culture, or a warm close greenhouse, while growing in the early part of summer, and afterwards may be ripened and kept in a greenhouse; but as they bloom chieﬂy in autumn, warmth is desirable to enable them to expand their ﬂowers. A minimum winter temperature of 5-10°C is acceptable, providing that plants are kept absolutely dry. Exposure: They prefer light shade rather than full sun, although stems may not colour up under shady conditions. Pest & diseases: Keep their roots free of mealy bugs, as fungal attack often occurs as a result of damage to stems by insects. A layer of grit on the surface of the compost prevents moisture from accumulating around the base of the stems and minimise the chance of fungal attack on the roots. Propagation: Plants are increased by cuttings, which, as they are very succulent, should be allowed to dry a week after they are taken off, when they may at once be put singly into pots.